BEACH JEWELER BRINGS HIGH-PRICED ROCKS TO GAWKERS AND BUYERS. Almost 70 years after Joan Crawford first danced the Charleston before movie cameras, she still had them standing in line Friday. At 10 a.m., when Hardy's Diamonds opened, people were lined up and pounding at the door for entry. The draw was glamour, mixed heavily with nostalgia. Jewelry from the estate of Joan Crawford was not only on view, but the pieces of the legend were for sale. 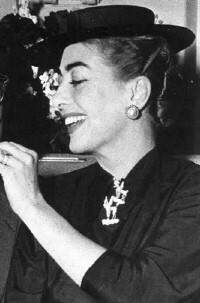 "Fascinating,'' one woman murmured, peering at a platinum baguette diamond necklace Crawford once wore to swank premieres and parties. It was priced at $81,250. "Tacky,'' someone else commented, considering two hefty poodle pins, with ruby and sapphire eyes and pearl halos. Offered only as a set, the pins were priced at $19,375. A much more eye-boggling treat was a 75-carat amethyst ring designed by Raymond Yard, who also did many pieces for the Rockefellers. It was priced at a mere $10,000. ``How could you hold your hand up with that on it?'' one gawker asked. Near the jewelry case was a book of photographs showing Miss Crawford wearing the ring; she seemed to have no trouble whatsoever managing. The cynics might protect themselves with smarty comments, but the lure of Hollywood glamour is still potent. Diamonds, as they say, are forever - at least in this market. George Hardy, owner of the local jewelry store, said the pieces, which are only a small part of the Crawford estate gems, came from a private collector in New York. They were driven from New York aboard a Brink's security truck. On screen, Crawford played the same type of American woman all those years, up until her death in 1977 - the working woman who used determination and stamina to claw her way to the top. She made no pretense about her rags-to-riches path. She started as a waitress named Lucille Le Seur in San Antonio, Texas, and became Joan Crawford only after a nationwide contest to give her a new name. Charm bracelets in the Hardy's display offer some clues to the woman's private life. They carried inscriptions from suitors, friends and her four husbands. The collection was recently displayed in Palm Beach, where the prices were much higher. The $10,000 ring was priced at $23,000 there. The poodle pins were priced at $34,500 in Palm Beach but $19,000 here. No, they didn't sell in Palm Beach, but at least two of the charm bracelets had sold in Virginia Beach by 11:30 a.m. One went to a local man, whose wife stood by him as he purchased it, and insisted that they remain anonymous. The other went to a collector who called from Idaho and asked that one of the bracelets be held. Both went for just under $20,000. In life, Joan Crawford most often played her own life - the million-dollar baby from the 5-and-10-cent store. She would have liked the idea that, after all these years, she is definitely priced out of the 5-and-10 range. MEMO: The Estate Jewelry Show and Sale, featuring the jewelry of Joan Crawford, continues from 10 a.m. to 6 p.m. today at Hardy's Diamonds, 4212 Virginia Beach Blvd., Virginia Beach.